All of our reins feature supple English or Italian leather and are handcrafted to the highest standards exclusively for KL Select. Added value features include stainless steel buckles or hook-studs, finished bevel edging, and tapered ends. 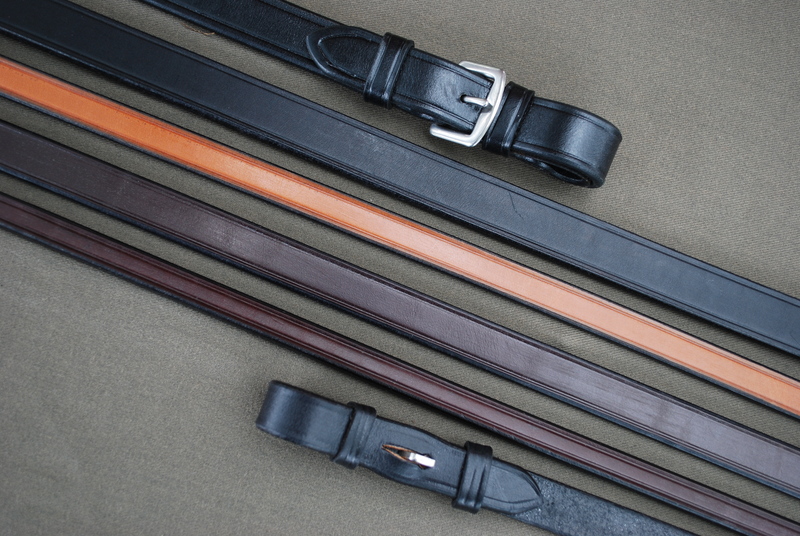 Many of our reins are available in both Full size (54″) and also XL (60″). Please read rein descriptions for their corresponding details such available length and color/fastener options. The 3/4″ Pebble Grip Reins are a soft pliable Biothane rein, with large pimples, that is easy to hold and provides an extra grip. Options: Black buckle, Black hook stud, Brown buckle, Brown hook stud. All options available in Full & XL. Also, Pony Brown hook stud (48)”. Our 1/2″ and 5/8″ Red Barn Rubber Reins are a like a traditional rubber rein, but feature small pimples. Options: Black hook stud, Black buckle, Brown hook stud, Brown buckle. Also available: XL 5/8″ Black buckle, and XL 5/8″ Brown hook stud. The KL Select Rubber Reins are a traditional rubber rein, with large pimples. Options: 5/8″ & 3/4″ wide, Black or Brown. All width options are available in Full size, either buckle or hook stud. Also available: XL 5/8″ Black buckle. 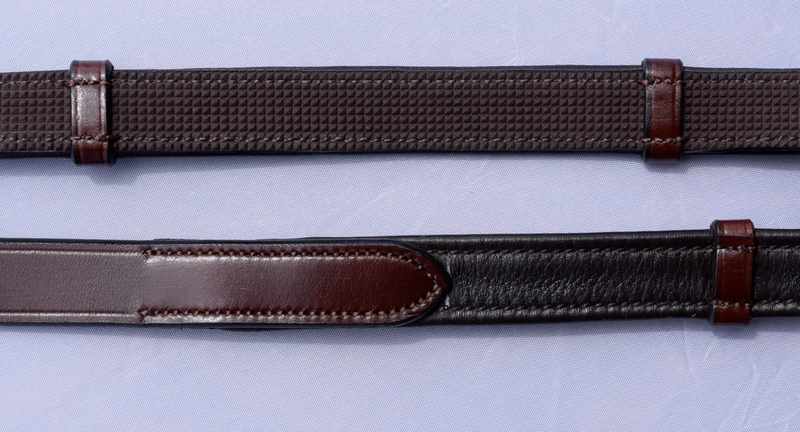 The 5/8” Rubber Reins with square raised, fine white stitching on the leather ends. Options: Brown, Full & XL, hook stud only. The 3/4″ Special Grip Rein combines both web and exterior strips of rubber, with stops, for added stay. A best-seller. 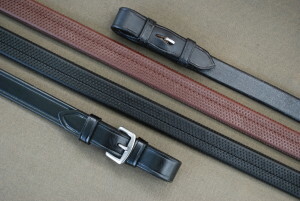 Options: Black buckle with stops or Brown hook stud with stops, Full size. 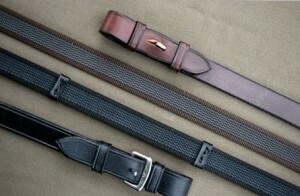 Also available: XL Black buckle & XL Brown pin. 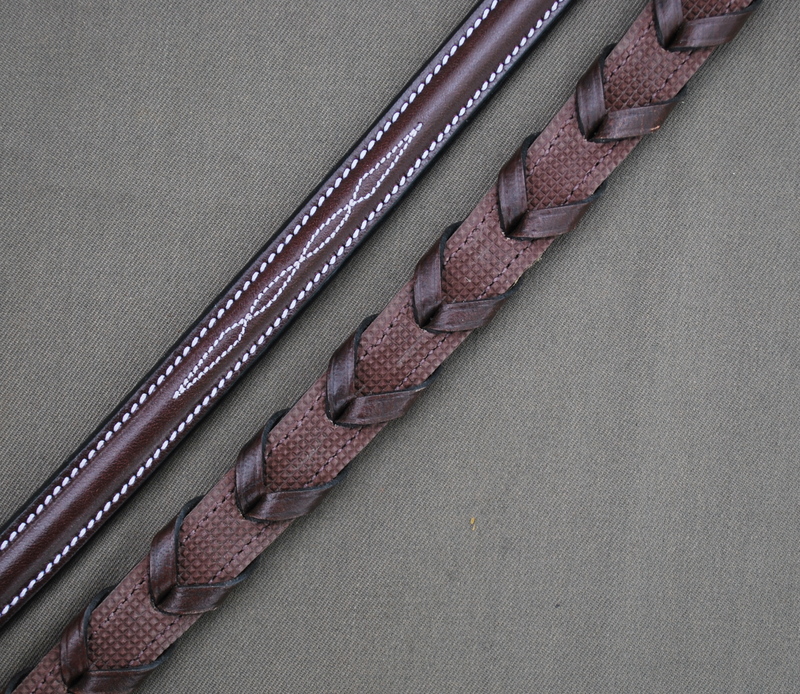 The 5/8″ Monkey Grip Reins incorporate both web and rubber, woven through for extra grip, yet with a soft feel. 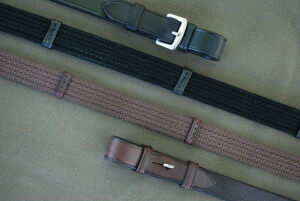 Options: Black buckle, with and without stops; Brown buckle with stops, Brown hook stud without stops. Full size only. The 5/8″ Stealth Rein is a rubber lined laced rein, discreet enough for the show ring. Round raised fancy stitched, hook stud ends. Full size only. The 5/8″ Fancy Laced Reins, with fancy stitching to match our Hunter Bridles, are available as a separate item. Options: Brown round raised and square raised, Full size and XL. Also available: Pony, Brown round raised, (48″). The 5/8″ Laced Reins are available in round raised with White stitching, available in Full & XL, to match our Kingston bridle. The 5/8″ Calf Lined Reins are a soft, tactile calf skin wrapped Dressage Rein. 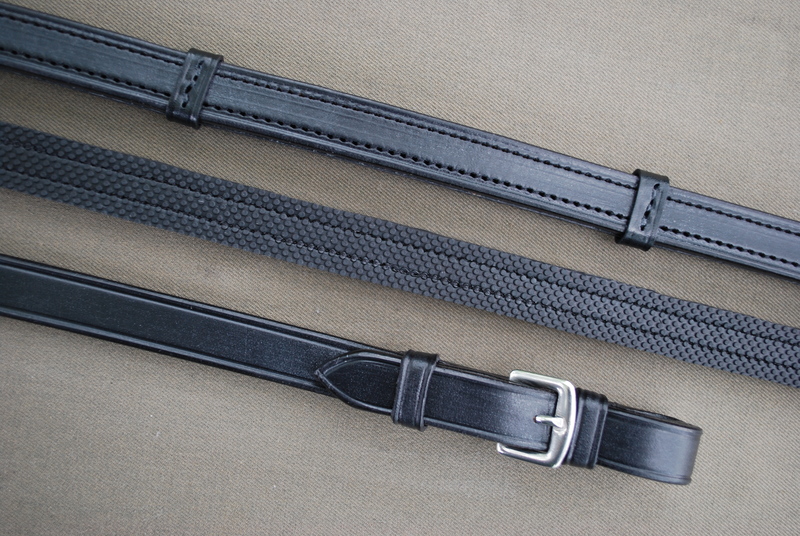 Options: Black buckle, Black hook stud, both available in Full & XL. 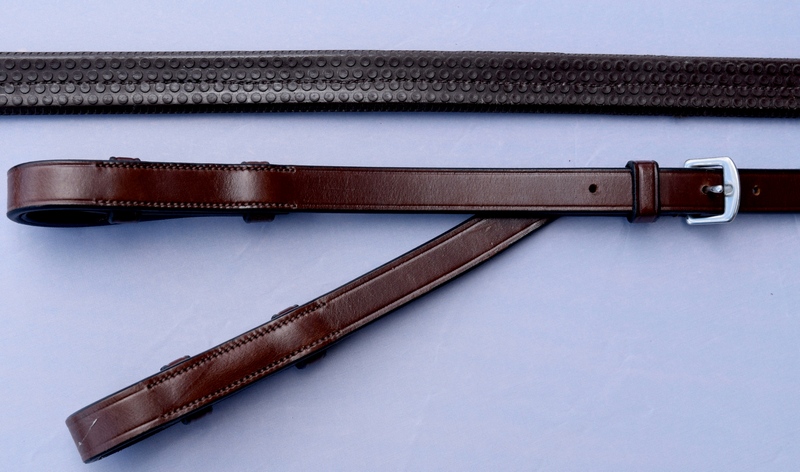 Our Dressage Reins are available in two widths, both Full & XL. 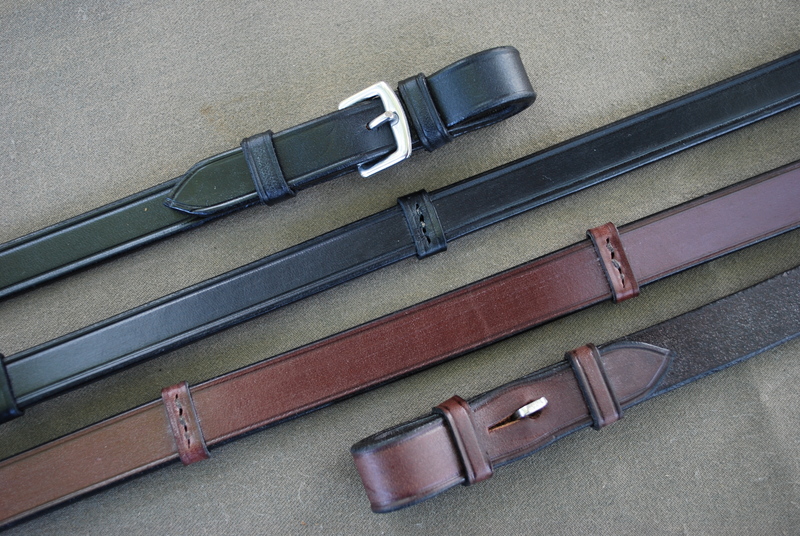 Options: 3/4″ Black buckle, Black hook stud and Brown buckle; XL Black buckle or hook stud. 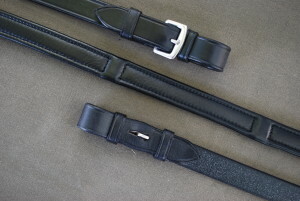 Also available: 5/8″ Black buckle, Full & XL. The 5/8″ Easy Grip Reins are a rubber lined Dressage Rein, with stops. A best-seller. 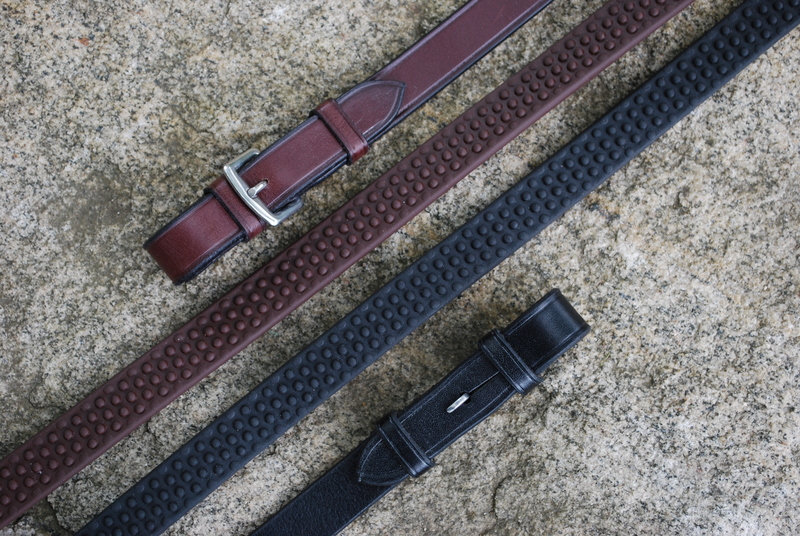 Options: Black buckle, Black hook stud, Brown hook stud (Full size only). Also available: XL Black buckle and Black hook stud. 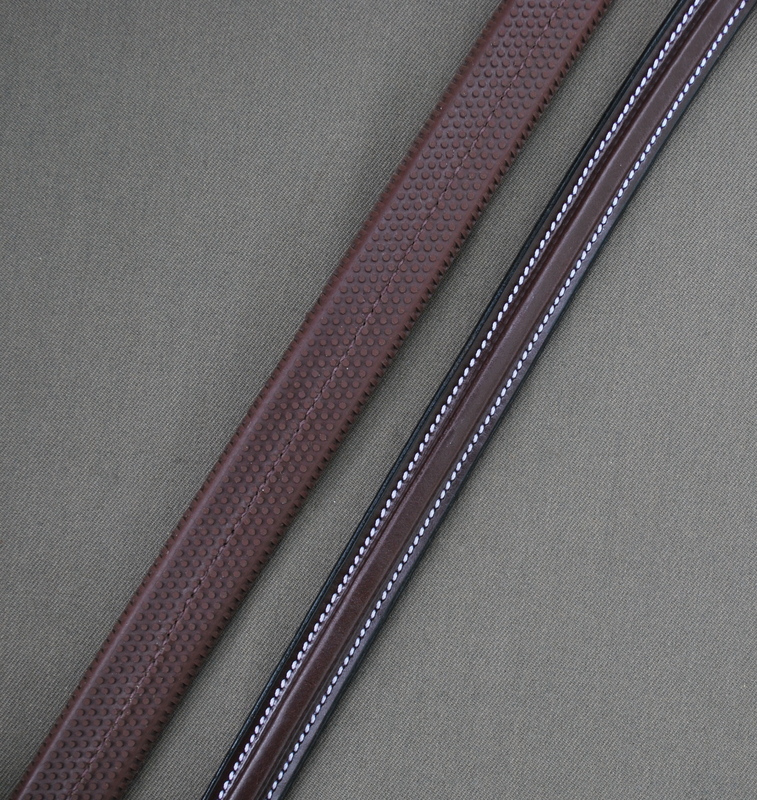 Our Plain Reins are available in a variety of options. Options: 3/8″ Brown hook stud; 1/2″ Brown hook stud, 1/2″ Black buckle, 1/2″ Pony Brown hook stud (48″), XL 1/2″ Brown hook stud. 5/8″ Brown hook stud, Black buckle; 3/4″ Brown hook stud, Black buckle. Our Curb Rein is 56″ long, available in two widths, and has a snick to hold it in place over the horse’s neck when not in use. 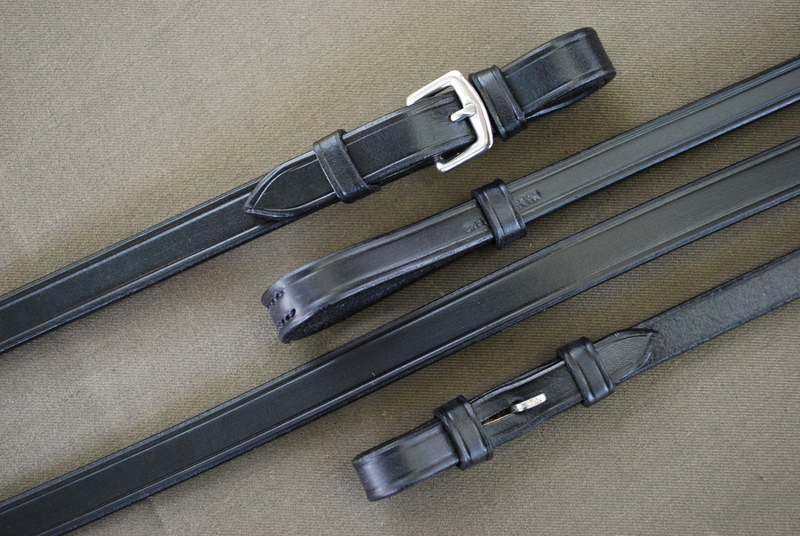 Options: 1/2″ Black buckle & Black hook stud; 5/8″ Black buckle & Black hook stud. 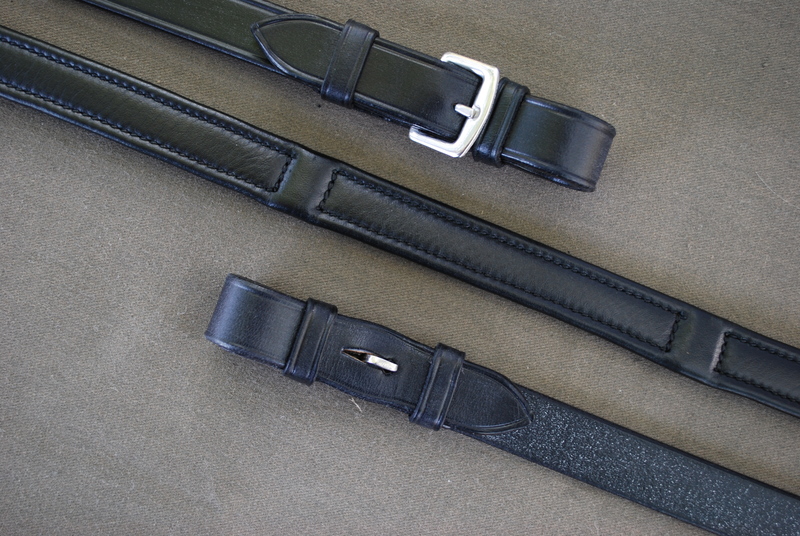 Also available XL: 1/2″ Black buckle & Black hook stud. 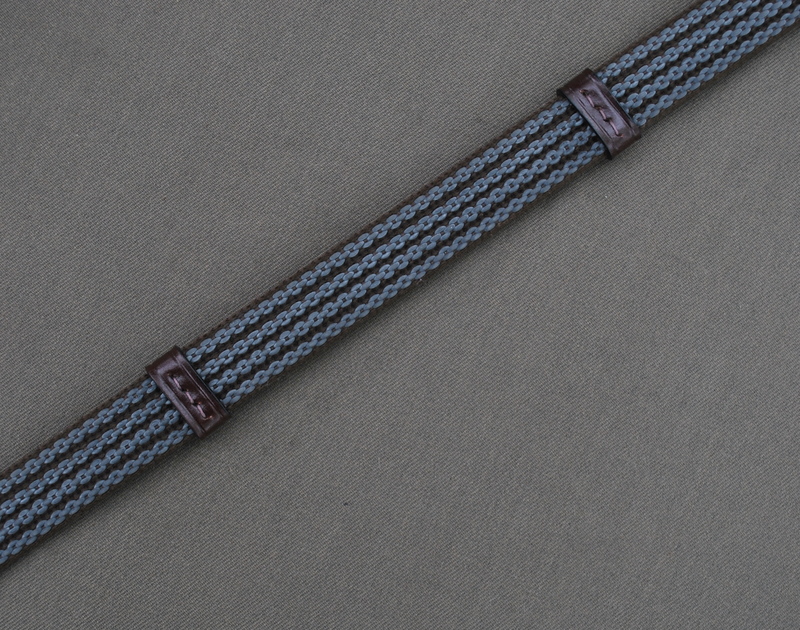 The 3/4″ Web Reins are made in a soft cotton material, with leather stops. Options: Black buckle, Brown hook stud. Also available: XL Black buckle. 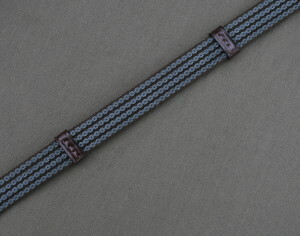 The 5/8″ Double Laced Reins are a modern version of the Plaited Rein, suitable for the “A” circuit. They provide extra grip with a subtle sophisticated style. 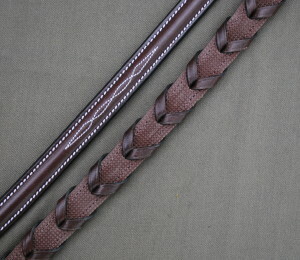 Round raised fancy stitched to match any hunter bridle. The 5/8″ Soft Grip Reins are a fusion of our Easy Grip and Calf Lined Reins. 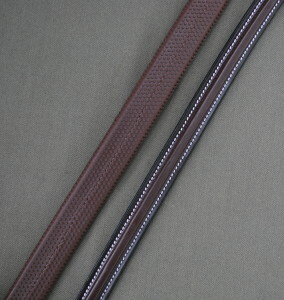 The Soft Grip Reins are rubber lined, calf skin reins with stops. Supple and easy to hold, with extra grip. A best-seller. Full size only. 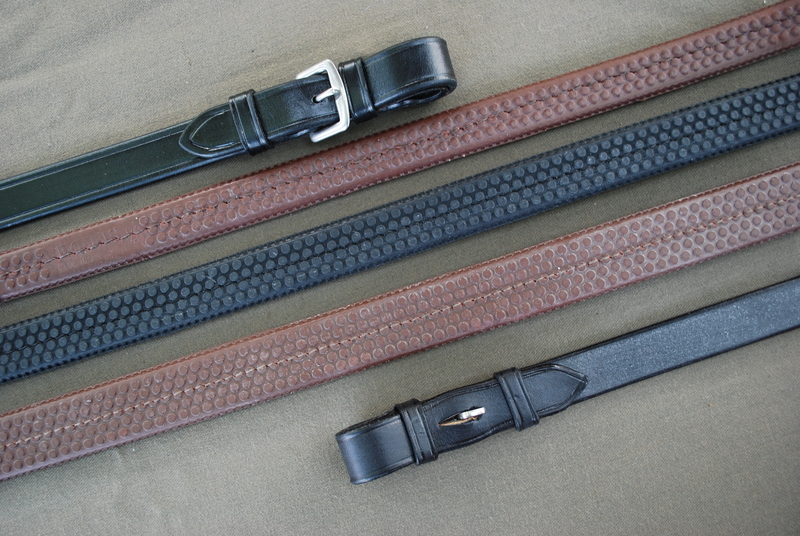 Options: Black buckle, Black Pin, Brown buckle, and Brown hook stud. The 5/8″ Pelham Converter Reins, allow for the use of just one rein while using a Pelham bit. This supple rubber rein (nylon inside) features split ends, with an movable buckle to adjust pressure. Full size only. Available in full size, hook stud. The 5/8″ Split End Laced Reins, or Pelham Converter Reins, allow for the use of just one rein while using a Pelham bit. This laced features split ends, with an movable buckle to adjust pressure. Full size only. Available in full size, hook stud.